Excellent writing should “create a longing in the reader” was early advice given by Robin Coste Lewis during the author’s chat at NIMROD’s Write Night. 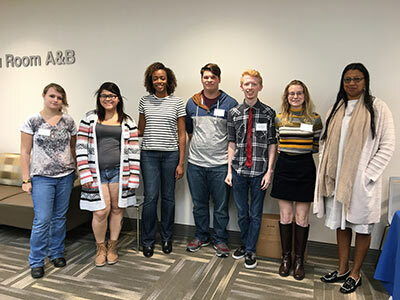 Cowley College writing instructors Marlys Cervantes and Ryan Doom attended NIMROD’s Write Night and Writers’ Conference at the University of Tulsa with a group of students this past weekend. Students attending the event were Kelsey Boles, Kaitlyn Cathey, Austin Crowe, Aryana Hess, and J.C. Pappan. The faculty members and students participated in Master’s classes focusing on a variety of writing concepts, their own writing, and publishing ideas. Keynote speakers were poet Robin Coste Lewis and novelist Angela Flournoy. Among her many awards, Lewis most recently won the 2015 National Book Award for Poetry for her collection, Voyage of the Sable Venus. Flournoy, a finalist for the 2015 National Book Award for her novel The Turner House, was a National Book Foundation “5 Under 35” Honoree. Anyone with questions about Cowley’s program should contact Cervantes in the Humanities department at Cowley College. Those pictured are, from left, Kelsey Boles, Aryana Hess, novelist Angela Flournoy, J.C. Pappan, Austin Crowe, Kaitlyn Cathey, and Poet Robin Coste Lewis.